Thought I could take the car, go pick up dead computer from repair shop A, drive across town to repair shop B, then park near town centre, all within 20 mins. Took 20 mins -- to fetch from shop A -- then another 20 mins to do the rest. Meaning I arrived around 1:25pm for a 1:05pm rendezvous. Oh well. 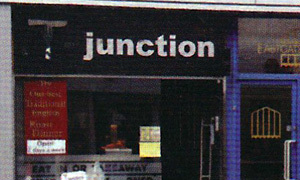 What more apt place for a meet-up than T Junction, promising "traditional English roast dinners". Opposite the dead Co-op department store and nestled in the sweet spot between Argos and QD, it's been around for yonks. My word, it's popular. They're not blessed with space in there and Andy's sharing a table, not with strangers but with friends he's not yet met. Not up to the full roast experience, I order a hot pork roll. He's halfway through his "unremarkable" vanilla cheese cake. And still the punters roll in for their £6.50 roasts with "potatoes, carrot, swede, cabbage, peas, Yorkshire Pudding and gravy". My selection is far more modest: pork in a couple of soft white baps. Not the best combo, as previously shown in Something Yummy, though there's some bonus salady bits on the side. You need some man-bread, maybe granary or wholemeal or even a pitta. Should have gone for the burger or wrap. One selling point for the TJ is their offer of free home delivery. Goodness knows how your beef dinner is presented. Anyways, only time for an Americano, and it's good. Very good. If it was a car -- Model T.
If they were passing by -- Daniel Casey.